Spot gold is relatively stable on Monday, after slipping nearly 1 percent in the previous session, while the dollar mixed - down against the euro but rose versus some other currencies, and holidays in Australia, is expected to create anxiety in the trade. * Spot gold fell 4 cents to $1,530.99 an ounce by 0118 GMT, after ending last week half a percent lower. * U.S. gold edged up 0.2 percent to $1,532.30. * The dollar fell 0.1 percent versus the dollar, by rose 0.05 percent against a currency basket .DXY. * More data is scheduled to be released from the world's top gold producer, including inflation where the market expects a small rise to 5.4 percent in consumer prices. 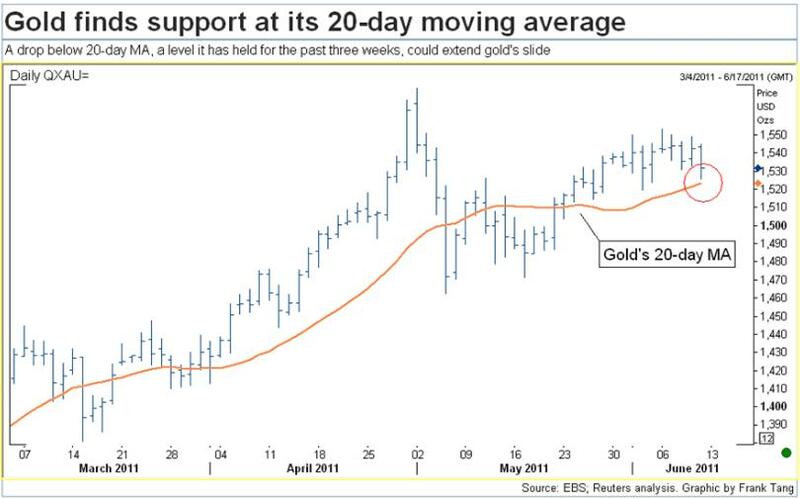 * Support for gold was seen at its 20-day moving average of $1,524, a level it has held for the past three weeks. * Silver rose 0.2 percent to $36.21 after slipping more than 3 percent on Friday. Equities lacked clear direction in a week which was decidedly mixed as far as commodities were concerned. On the bigger stage traders continued to fret over the state of the global economy. Even so, gold edged lower to US$1,532 per ounce while silver held firm at US$36 per ounce. Platinum fared better, rising to US$1,828 per ounce, and palladium climbed to US$813 per ounce. Copper slipped to US$9,016 per tonne, or US$4.09 per pound, while nickel reversed its downward trend to climb to US$22,905 per tonne. Zinc also strengthened, rising to US$2,272 per tonne. Amongst the majors, Xstrata slipped 2.2 per cent to 1,333p, Rio Tinto edged higher to 4,111p, BHP Billiton rose to 2,308p and Anglo American rose to 2,946p. Commodities trader Glencore climbed 2.1 per cent to 516p. Two miners resumed operations after resolving labour disputes. Following the dismissal of workers taking industrial action at its Karee operations, platinum miner Lonmin has largely completed the recruitment of replacements. Production at Karee has now resumed and is ramping up, although management estimates that full-year sales will be around 30,000 ounces lower than previous guidance. Sales for the year to September are now expected to total around 720,000 platinum ounces. Lonmin’s shares closed 7.4 per cent lower at 1,460p. Cluff Gold also successfully resolved a labour dispute. Normal operations have resumed at the company’s Kalsaka mine in Burkina Faso. The company also stated that the disruptions have not affected the company’s production guidance of 70,000 ounces from Kalsaka in 2011. The shares recovered 12.7 per cent to 95.75p. And in a dispute of a different kind, in the boardroom, the murky tale of ENRC continues. ENRC lost a lot of friends when it sided with the Congolese government in the sequestration of the Kolwezi tailings project from First Quantum. That prompted a US$2 billion lawsuit from First Quantum, which is pursuing the case from the safety of the British Virgin Islands. Most recently, two independent non-executives have been voted off the board, exacerbating a sense of unease in the market about the company’s corporate governance. The stock exchange said that the company was not in breach of any rules, but the uncertainty continued on Sunday as a report that Glencore was considering making a takeover offer appeared in the papers. ENRC shares dropped by more than 50p to 742p. In gold exploration, Patagonia Gold provided a positive update from its Monte Leon gold-silver prospect in Santa Cruz province, Argentina, where drilling has intersected wide, near-surface zones of potentially bulk mineable gold and silver over a strike length of one kilometre. Markets wanted more, though and the shares slipped 7.5 per cent to 40.25p. In Ghana, Goldplat published a technical report on its recently acquired Banka project in the Ashanti gold belt. The report suggests that Banka offers significant potential for an upgrade to the current non-JORC compliant resource of 262,107 ounces of gold. The shares closed 3.3 per cent lower at 11p. In South Africa, Pan African Resources announced encouraging results from drilling the at Bramber tailings dam at the company’s Barberton operation. If viable, production from tailings could increase output from Barberton by 20,000 ounces per annum, which should lift total output comfortably above 100,000 ounces. The shares stayed firm at 10.75p. Away from gold, uranium investor Kalahari Minerals announced a resource update for the Husab uranium project in Namibia in which it holds a 42.76 per cent interest via an investment in Extract. The total resource has increased 33 per cent to over 500 million pounds of U3O8, and Husab is now recognised as the world’s fourth largest uranium deposit. The shares edged higher to 234p. The challenges continue for African Barrick Gold. Just weeks after its North Mara mine in Tanzania was attacked by 800 intruders in an assault that left seven intruders dead, the company has had to refute media reports that Tanzania is to impose a mining super profits tax similar to that proposed in Australia. The company asserted that its mineral development agreements cannot be amended without its agreement, although the market wasn’t convinced and the shares closed nine per cent lower at 411p. Another miner facing potentially heightened political risk is Minera IRL, whose operations in Peru could be vulnerable should the newly-elected leftist government decide to impose populist policies. The market was relaxed about the threat, though, and the shares strengthened 2.2 per cent to 71p. EMED Mining has long suffered government delays to the planned reopening of the Rio Tinto copper mine in Spain. Nevertheless, detailed geological investigations have identified significant underground mining potential for the project once it does get up and running. The shares closed 3.3 per cent lower at 10.4p. The week's political challenges didn’t deter two miners from floating on the Alternative investment market. First came Strategic Minerals, which raised £750,000 through a placing at 5p to fund the next phase of exploration at its magnetite iron ore exploration project in northeast Queensland, Australia. Then on Friday, Touchstone Gold raised £10 million through a placing at 27p to fund exploration and development at its Rio Pescado project in Colombia. Strategic Minerals closed the week at 12p and Touchstone Gold at 30.9p. However, it wasn’t all good news on the fundraising front as Nautilus Minerals was forced to abandon its substantial Canadian fundraising as a result of poor market conditions. The company remains debt-free and holds cash of US$139 million as it works to bring its first sub-sea project to completion. The shares slumped 18 per cent to 135p. Several miners were on the acquisition trail, including Sable Mining Africa, which acquired a 49 per cent interest in the Lubimbi coal project in Zimbabwe. Historical work here has indicated an in-situ resource in excess of one billion tonnes and the company is planning an immediate exploration and development programme. The shares slipped 1.3 per cent to 19.75p. Meanwhile, coloured stones specialist Gemfields entered into a conditional agreement to acquire a 75 per cent interest in a ruby deposit based in the Cabo Delgado province in Mozambique. The consideration of US$2.5 million will be paid in stages. Gemfields shares gained 1.4 per cent to 17.75p. In South America, Orosur Mining has entered into an agreement to acquire a 100 per cent interest in the Talca gold property in Chile for a phased consideration of US$7.6 million. Orosur also announced a US$13.5 million placing at 66p a share. The shares slipped 0.5 per cent lower to 70.63p. Finally, GGG Resources gained 7.1 per cent to 26.13p after it extended the closing date its off-market takeover offer for partner Auzex Resources until 4 July 2011. The slide in share prices we’ve seen over May and June has been more like a slow melting process, as each week has produced slightly lower numbers. The outlook for next week is not much better, given that the Dow Jones index on Wall Street closed below 12,000 points for the first time since March. All of the key indices on the ASX lost ground last week, but not substantially. The all ordinaries index had four modestly down days and one up, to shed a relatively painless 0.7 per cent overall. The metals and mining index did even better, losing just 0.5 per cent, while the gold index suffered the biggest decline, at 2.3 per cent, though that didn’t tell the whole story because a reasonable number of gold companies also rose. Shall we start with gold, then? Because while the world worries, gold often performs at its best. There two things that are more certain than gold: death and taxes, and the issue of taxes was again in the news this week. The Australian Government seems to have two tax surprises in store. The resource rent, or super-tax, has reached the draft legislation phase with the release of a review which, surprise-surprise, further complicates an already complex proposal. What the government wants to do is force miners to value individual mining leases inside their projects. Naturally, some of those leases will be of lesser value because they contain less ore. The upshot is expected to be a decline in allowable depreciation and an increase in tax. Couldn’t agree more, but it’s an indication of the determination of the government to tax anything that moves, or burns, because the new carbon tax is also moving down the legislation runway, speeding up to catch the coal miners. Until now, the coal companies thought they would get a reprieve for being exporters. Not so. So from next year, or the year after, coal companies will have two new taxes to contend with, the resources super tax and a carbon tax. Enough boring tax talk. Let’s have some prices. We’ll start with gold, but also toss in a few of the outperformers in other sectors to provide our readers with a few fresh names. Best of the gold explorers was one we’ve never heard of before, Alloy Resources (AYR). It doubled in price last week, rising from A3.2 cents to a peak on Thursday of A7.6 cents in massive turnover. More than 113 million shares changed hands on the day, out of an issued capital of 146 million shares. Sanity returned on Friday and Alloy closed at A5.9 cents for a gain over the week of A2.7 cents, or 84 per cent. Driving the shares was a fresh gold discovery called Warmblood at the company’s Horsewell project in Western Australia. Best intersection was 32 metres at 3.9 grams a tonne from the surface, and 8 metres at 4.4 grams per tonne from 12metres. Nor particularly high grades, but presumably they link up with earlier drill results. That seems to be the theory. By the way, Alloy’s chairman is a well-known mining character down this way, Peter Harold, chief executive of the nickel miner, Panoramic. Let’s keep going with prices please. Also up in a down week was Troy Resources (TRY) which is showing the benefits of a management marketing tour of North America. It added A21 cents to A$3.68. Azumah (AZM), one of the Aussie gold companies busy in West Africa which we took a look at last week, added A3.5 cents to A56 cents. Allied Gold (ALD) continued to recover lost ground, putting in a rise of A4 cents to A55 cents. Kingsgate (KCN) released an optimistic production forecast and was rewarded with a share price rise of A57 cents to A$8.20. Ausgold (AUC), the company which thinks it is on to something big near the wheat-belt town of Katanning in WA, rose by A10 cents to A$1.48, and might be worth a site visit soon. Among the other gold movers was Beadell (BDR), up 1.5 cents to A80 cents. St Barbara (SBM) rose A3 cents to A$1.85, while its takeover target, Catalpa (CAH) was steady at A$1.72. Perseus (PRU) posted one of the biggest falls of the week, shedding A21 cents to A$2.36. Crusader (CAS) was also sold off quite heavily, losing A20 cents to A$1.00. After that most falls were modest. Kingsrose (KRM) lost A6 cents to A$1.37. Silver Lake (SLR) slipped A4 cents lower to A$1.67, and Adamus (ADU) eased back by A3 cents to A60 cents. Iron ore next, because there seems to have been a bit of action there. Territory (TTY) was the star of the week as its long-term trading partner, Noble Group from Hong Kong, weighed in with an all cash A50 cent-a-share bid to try and knock South Africa’s Exarro out of contention. On the market, Territory added A5.5 cents to A52 cents, a price which indicates that some investors expect Exarro to counter bid. Elsewhere, Atlas (AGO) rose by A7 cents to A$3.65. Haranga (HAR), a company we rarely hear anything about, attracted interest with a rise of A4 cents to A30 cents as its makes progress at its Mongolian iron ore exploration projects. After that most moves were minor. Fortescue Metals (FMG) slipped A14 cents lower to A$6.32. Mt Gibson (MGX) shed A2 cents to A$1.76. Gindalbie (GBG) lost A4.5 cents to A89 cents, and Sherwin (SHD) was A1 cent lighter at A14 cents. The base metals next, starting with copper, please. A mixed bag, but without any significant moves up, or down. Sandfire (SFR), which is worth a closer look next week, added A16 cents to A$7.17, as investors continue to digest its very positive feasibility study into the DeGrussa project. OZ Minerals (OZL), Sandfire’s biggest shareholder, added A7 cents to A$13.70. Anvil (AVM) was one of the only other copper companies to rise, putting on A5 cents to A$5.67. After that came a list of declines. PanAust (PNA) lost A4 cents to A$3.77. Rex (RXM) was down A14 cents to A$2.52. Metminco (MNC) dropped a fairly sharp A6.5 cents to A30 cents, and Hot Chili (HCH) was A2 cents weaker at A58 cents. All nickel companies lost ground. Most zinc companies rose, marginally. Among the nickels Mincor (MCR) fell by A10 cents to A89 cents. Panoramic (PAN) was A4 cents weaker at A$1.79, and Western Areas (WSA) fell by the same amount, A4 cents, to A$5.99. Best of the zinc companies was Perilya (PEM) which rose by A1.5 cents to A66 cents. Blackthorn (BTR) gained A1 cent to A53 cents, and Ironbark (IBG) firmed by A2 cents to A29 cents. There were only a few risers, but lots of fallers. Whitehaven (WHC) was the lone coal company to rise, just. It added A8 cents to A$5.59. Falls were posted by Aquila (AQA), down A42 cents to A$7.75 as it continues to have joint venture problems, Coal of Africa (CZA), down A1 cent to A$1.16, Carabella (CLR), down A8 cents to A$1.96, and Coalworks (CWK), down A6.5 cents to A65 cents. The three uranium companies rise were Extract (EXT) which added A3 cents to A$7.79, Berkeley (BKY) which rose by A5 cents to A44 cents, and Forte (FTE), perhaps thanks to our midweek report, which managed a rise of A0.4 of a cent to A7.2 cents. Then come the falls, led by Paladin (PDN) which was hit by rumours about funding issues, and which dropped A24 cents to A$2.79 on the week, but did get as low as A$2.68 at one stage on Thursday. Bannerman (BMN) lost A1 cent to A29.5 cents. Toro (TOE), sold down to A7.6 cents, off by A0.7 of a cent, and Energy and Minerals (EMA) fell by A2 cents to A13.5 cents after reporting fresh legal problems. Much like the rest of the market. A handful of rises and plenty of small falls. Alkane (ALK) was the pick of the rare earth companies, putting in a rise of A30 cents to A$2.35. Iluka (ILU) was in demand thanks to sky-high zircon prices. It added A$1.64 to A$17.49. Lithium stocks firmed. Galaxy (GXY) put on A1.5 cents to A86 cents, and Orocobre (ORE) added A3 cents to A$2.18. Potash stocks weakened. South Boulder (STB) fell A2 cents to A$3.13 and Minemakers (MAK) was off by A1 cent to A45 cents. Biggest fall of the week was freshly listed Kimberley Rare Earths (KRE) which dropped A4.5 cents to A16.5 cents after being stopped from completing a related party asset purchase ASX regulators. The summer doldrums have hit the resource-rich Canadian markets, and a notable lack of buying interest has caused the broader markets to decline on weak volumes. And the critical game six of the Stanley Cup finals to be held in Vancouver on Friday also seemed to have many investors focussed on hockey rather than money. Once all the trading was done this past week, the TSX Ventures Exchange, home to more junior exploration companies than anywhere else in the world, had dropped 5.87 per cent, while the TSX Gold Index had fallen 4.84 per cent. Let’s start off with the political news out of Peru and how that impacted the Canadian-listed companies working there. Righto. The presidential election victory went to leftist candidate Ollanta Humala and that sparked renewed concerns that mining taxes will be raised and that the government may take control of the country’s natural resources. As we said in our article earlier in the week. Precisely. Since then companies operating in Peru, along with Humala himself have attempted to reassure investors that the concerns are overdone. But there were still plenty of fallers come the end of the week. Candente Copper lost C$0.17 to close at C$1.39, Sulliden Gold dropped C$0.27 to C$1.90 and Bear Creek Mining fell C$1.15 to C$5.05. What’s been going on elsewhere? Drilling news produced mixed results, depending on the whims of the market. Kaminak Gold tabled the first set of results from its highly anticipated drill program on the Coffee project in the Yukon’s White Gold district. Despite cutting 27 metre of 2.5 grams gold per tonne and 10.4 grams gold per tonne over six metres, investors were unimpressed because Kaminak ended the week down C$0.22 at C$3.31. But B2Gold prompted some buying after the company announced results from its newly discovered Cebollati gold property in Uruguay. Highlights included 2.2 metres of 23.61 grams gold per tonne. B2Gold closed at C$3.68 for a C$0.42 gain. However, despite cutting 112.9 metres of 2.51 grams gold per tonne at its Ana Paula project in Mexico, shares of Newstrike Capital lost C$0.20 to close at C$1.85. And Avion Gold continues to hit the goodies at the Vindaloo zone at its Hounde project in Burkina Faso. The latest results included 32 metres running 11.48 grams gold per tonne. Avion ended the week up C$0.11 at C$1.64. Duluth Metals tagged 34.5 feet averaging 2.82% copper equivalent from its Nokomisdeposit in Minnesota. Duluth ended the week up C$0.04 at C$2.21. Trade Winds Ventures tabled a drill intercept of 4.37 grams gold per tonne over 15 metres at its 50 per cent owned Block A joint venture project in northeastern Ontario. Not good enough in a down market, though, because Trade Winds closed at C$0.22 for a C$0.025 loss. Minera Andes managed to table earnings of $17 million, or $0.06 per share, for the three months ended March 31st, 2011. The company’s 49 per cent owned San Jose mine in Chile produced 18,000 ounces of gold and just over 1.34 million ounces of silver. For the week, Minera Andes lost C$0.11 at C$2.29. On the diamond front, higher prices for rough diamonds propelled Harry Winston Diamond to first quarter earnings of US$3.6 million, up from US$2.9 million in the same three month period a year earlier. Harry Winston ended the week down C$0.04 at C$16. There was also a bit of a legal spat as Barrick Gold took on Goldcorp, New Gold and Xstrata over Goldcorp's purchase of Xstrata's 70 per cent interest in the El Morro project and its subsequent sale to New Gold. Barrick claims that the deal with Goldcorp breached El Morro shareholders' agreement and is now going to trial in Ontario’s Superior Court. Barrick is looking either to regain the 70 per cent stake in the project or to get financial compensation for economic damages. Barrick ended the week down C$2.25 at C$42.62, Goldcorp fell C$1.78 to close at C$46.20 and New Gold dropped C$0.52 to close at C$8.99. The job market in Canada has shown some improvement but all eyes are on the end of quantitative easing by the United States Federal Reserve as of June 30th. The stopping of the printing presses is widely expected to impact commodity prices and not in a good way. We will see what next week has in store. Of common occurrence, gold tends to breathe more easily during the summer in the northern hemisphere. However, there are some things that need attention, such as Sprott Asset Management chief investment strategist, John Embry, who believes this year may be a little different. Embry once said, because of what happened at the big picture geopolitically, gold tends to have a great summer. "I don't like putting numbers and dates in the same sentence because you always make yourself look bad - but I would be very surprised if it doesn't take out $1,650 this summer and maybe headed towards $1,800 over the next three months," he said. To back up the statements, Embry points to a number of macroeconomic factors that are likely to have a bearing on gold prices over the next few months. Firstly, much of the seasonality that is traditionally associated with the metal comes from Asia where gold purchasing is strongly related to the wedding season and, in India because much of the demand traditioanlly comes from rural areas, the sowing cycle. "People forget," Embry said, "that the gold market is changing fairly significantly from traditional sources of demand into investment demand as an alternative to currencies... investment demand doesn't know seasons - it buys gold because it is fearful of other assets." Fear is a dominant theme in another of this summer's big economic events - the end of quantitative easing in the U.S and worries about the country reaching its constitutionally mandated debt ceiling. Embry says, these two events are likely to have a significant impact on the gold price, especially given the recent data that suggests, the U.S. economy could begin to recede once more. "If you want to withdraw enormous amounts of stimulus by cutting the deficit dramatically at this point, or if QE2 actually marks the end of quantitative easing there's no question that the United States' interests rates are going to go up dramatically because from the numbers I look at, the Federal Reserve has been buying the vast majority of the all the treasuries that have been coming into the market." "In my opinion we have reached the point of no return. We are either going to take a collapse in the dollar or a collapse in the economy depending on which direction they take. The idea that they can return to normalcy in my opinion is out of the question at this point. They are way too far off line." The third reason for gold's likely strong performance comes from Europe. "There are an enormous number of problems in Europe, just as there are in United States and to me the conclusion one should arrive at is neither of these currencies are attractive and that to me is one of the underlying factors why I am so bullish on the gold price," he says.
" I look at the Greece situation and I see absolutely no way out that's palatable to the euro and the European banks or what have you that hold a lot of this paper. In some way the Greeks cannot afford to carry the debt load they've have got and somehow that's going to have to be addressed." Beyond the summer, Embry continues to remain positive on the outlook for precious metals, but he does caution that it can never be only way traffic. "You are always going to have corrections and there are people who are in this market who are using leverage that had better be careful because the corrections can be quick and violent. But having said that, for you to say that the bull market in gold is over is essentially by saying that we are going to re-establish paper currency as viable and I don't think that's going to happen - I am of the mind that before this whole mess is ended we are going to have a new monetary system and as we make our way towards that, gold and silver will be refuges." PricewaterhouseCoopers reveals that the profit margin from mining world's top 40 companies are under the historical peak in 2006 and 2007 as a result of the high cost burdened profits. Profit margins for the world's top 40 mining companies are below the historical peaks of 2006 and 2007 as higher costs outweigh record commodity prices, PricewaterhouseCoopers said on Tuesday. Revenues for the world's 40 largest miners by market value rose 32 percent to a record $435 billion in 2010 on higher commodity prices and a 5 percent climb in production. However, cost pressures meant the return on equity was only 22 percent last year, compared with the highs of 31 percent and 28 percent in 2006 and 2007 respectively. "With no sign of inflationary pressures easing, maintaining cost discipline in a volatile global and financial environment remains extremely important for the industry," PwC's global mining leader Tim Goldsmith said. Top 40 mining companies have announced more than $300 billion of capital expenditure programmes, of which over $120 billion is planned for 2011, PwC said. "The real challenge now is addressing ever rising costs with huge forecast capital expenditure programmes compounding already tight labour and materials supply - and increasing complexities in operations, as sourcing new supply continues to move into more remote and challenging locations." Gold prices everyday is very fragile and easily influenced by a growing range of issues, one will be able to lead to the strengthening gold price as the currency continues to devalued. New York closed at the weekend with gold at $1,541 and Asia plus London took the gold price higher Monday. The dollar continued to want to weaken and stood at €1: $1,4640 for much of the morning in London before strengthening slightly to €1: $1.4420 ahead of New York's opening. In the euro gold was Fixed at €1,054.66 still at the bottom of its trading range. In the dollar gold Fixed at $1,542.75 nearly the same as it was in New York on Friday. Just after New York's opening the gold price was higher at $1,548, still not fully reflecting the fall of the dollar and in the euro at €1,058.08 slightly down on Friday's price. The dollar stood at €1: $1.4625. Silver rose well in London to stand at $37.05 after Fixing at $36.87 as New York opened. The week holds promise of another attempt to bailout Greece after the Greek government imposes further harsh austerity measures. One wonders how long the government can hold onto power as huge demonstrations there continue. We will be surprised if the Greek economy can bear even harsher burdens than it already has without some major reforms to bureaucracy and taxation. In the States we are sure that the bulk of fund managers are in investment strategy meeting to re-formulate their investment policies in the light of last week's labor figures. We look around the globe for some economic good news that will bring solid hope and can't find a significant amount. We don't think we will see economic collapse but may well see the bite of steady incomes in the face of inflation, which eats away at spending power. The developed world has been made cautious by the past four years of economic difficulties so another downturn will be quick to persuade people to pull in their spending horns even more. It does look as though the downturn will last as long as the downturn in the housing markets lasts. This is being forecast at up to four more years until the U.S. housing market is iin good condition again. By then the global investment scene will have changed dramatically. Swiss Franc: - Today: Sf1,293.57: 1 ounce of gold. Friday: 1,295.27: 1 ounce of gold. U.S. $: - Today: $1,546.50: 1 ounce of gold. Friday: $1,539.15: 1 ounce of gold. Euro: - Today: €1,058.49: 1 ounce of gold. Friday: €1,065.16: 1 ounce of gold. India: Today: Rs. 69,247.63: 1 ounce of gold. Friday: Rs.68,984.70: 1 ounce of gold. News of the weak U.S. economy rocked the capital markets and also impacted on their base metals market. Copper fell to U.S. $ 9,035 per tonne, or U.S. $ 4.10 per pound, and nickel fell to U.S. $ 22,575 per ton. Zinc closed lower at U.S. $ 2,245 per ton. Gold fared somewhat better, as investors took flight from equities, edging higher to US$1,543 per ounce. Platinum edged higher to US$1,816 per ounce and palladium also climbed higher to US$783 per ounce. However, silver retreated to US$36.23 per ounce. The turbulent market sent many mining shares lower, although there wasn’t much company-specific newsflow about. Amongst the majors, Rio Tinto and Chinalco have formed a joint venture to explore mainland China for world-class mineral deposits. Chinalco will hold a 51 per cent interest in the joint venture and Rio will hold 49 per cent. Even so, Rio closed 3.9 per cent lower at 4,101p. The other majors fared little better. BHP Billiton lost 3.4 per cent to close at 2,309p whilst Anglo American closed 2.2 per cent lower at 2,927p. Xstrata closed 3.7 per cent lower at 1,371p. Shares in trader Glencore closed 2.3 per cent lower at 512p as fresh concerns were raised over the group’s corporate governance. Amongst junior precious metals miners, Arian Silver admitted that it faces a number of operational challenges at its Mexican operations. In particular issues regarding the mill and plant, which were not specifically designed for treating ore from its San Jose mine, need to be addressed. Those problems resulted in a small loss for the mining operation in the first quarter, but were compounded by thefts of silver-bearing concentrate from the mill, which lead to lower-than-expected recoveries. Nevertheless, Arian plans to update the silver resource at San Jose in the coming months and to start another drilling programme. What’s more, the company reckons it will be able to fund operations, including ongoing exploration, from working capital and production cash flow. Arian’s shares slipped 7.3 per cent to 30p. Vatukoula Gold Mines also had a tough time of it, as it announced increased production from its Fiji operations to 29,743 ounces of gold in the six months to 28th February. The higher gold price helped lift gross profit from £4.5 million to £5 million. However, the market had been expecting annualised production to be pushing towards 100,000 ounces and the shares tumbled 22.7 per cent to 110p. Elsewhere, several juniors upgraded mineral resources during the week. Producer Highland Gold Mining announced that the Kyrgyz government had signed off on the company’s latest resource of 1.38 million ounces of gold at its Unkurtash project in Kyrgyzstan. The approval will facilitate the granting of a mining license and represents an important step towards mine development of the Unkurtash project. The shares edged 0.8 per cent higher to 151p. Also on the up was Pan African Resources, which increased the total mineral resource at its Barberton gold mine in South Africa by seven per cent to 2.55 million ounces of gold. There was also a significant increase in grade, which improved by 33 per cent to 8.35 grammes per tonne. The shares climbed 4.9 per cent to 10.75p. Elsewhere on the continent, African Consolidated Resources increased the resource at its Gadzema gold project in Zimbabwe to 912,000 ounces, as a result of ongoing drilling. The company’s total gold resource now exceeds 1.4 million ounces. But it’s not easy doing business in the land of Uncle Bob, and the shares slipped 9.4 per cent to 6p. Much worse, though, was the performance across the way in Mozambique, from Noventa. Noventa’s never been a Minesite favourite, but the company must have lost a few other friends too this week after its shares dropped from just over 170p to a meagre 55.5p in the space of a couple of days. The reason was an announcement that delays in construction and development at the company’s Marropino tantalum mine meant that it would need to seek new funds. Elsewhere in Africa, copper developer Discovery Metals announced a doubling of the mineralised depth of the Plutus deposit that forms part of its Boseto project in Botswana. The grades and mineralised thickness compare favourably with those at the nearby Zeta deposit and indicate that Plutus may also have potential for underground mining. The shares climbed 4.7 per cent to 83.25p. In southern Cameroon, Afferro Mining has been encouraged by high-grade intercepts at its Nkout iron ore project, which the company believes warrant additional drilling to evaluate the potential for a direct shipping operation, which would offer accelerated cash flow. The company plans to release an updated mineral resource for Nkout later this month. The shares slipped 2.4 per cent to 104p. It wasn’t all about the mining and resources though. There was also some corporate activity on the cards. Sylvania and Aquarius Platinum have agreed jointly to assess the Everest North UG2 platinum deposit in South Africa. Under the terms of the agreement ore will be processed through Aquarius’s Everest South metallurgical plant, and the resulting concentrate is likely to be sold to Impala Refining Services. Sylvania closed 6.6 per cent lower at 40.63p whilst Aquarius strengthened 0.9 per cent to 337p. Meanwhile, Turkey-focused Ariana Resources has acquired four gold exploration licences in western Turkey from fellow junior Kefi Minerals. The licences include high-grade veins where previous assay results have returned up to 152 grammes per tonne of gold and 1,320 grammes per tonne of silver. Ariana slipped 2.9 per cent to 4.25p while Kefi closed 5.6 per cent lower at 6.75p. Elsewhere, Herencia Resources has entered into an agreement to acquire a 51 per cent interest in the Guamanga project, a new copper-gold opportunity in Chile that lies approximately 750 kilometres north of Santiago. The project has potential for iron oxide, copper, and gold. The market wanted more, though, and the shares closed 15 per cent lower at 2.65p. One deal that seems to be taking forever to conclude is Shandong Iron & Steel’s investment in the huge Tonkolili iron ore project being developed by African Minerals in Sierra Leone. African Minerals announced further progress in its discussions with Shandong over the Chinese group’s proposed investment, although finalisation of the deal remains elusive. African Minerals climbed 9.2 per cent to 545p. Although some sectors are harder hit than others. Nickel companies suffered more than most, and a glimpse at the five-year nickel price chart reveals several reasons why the depth. Back in mid-2006 nickel color sold under U.S. $ 10 per pound. Today, this color is more than U.S. $ 10 per pound. Prices, however, is only part of the problem for Australian nickel miner. They have also been hit by higher costs felt in the mining industry, and exchange rates rise. With a real squeeze on profits. A very nasty squeeze actually, which can be measured using the exchange rate alone. Back in June, 2006, the Aussie dollar exchange rate against its US cousin was US74 cents. Today, it’s US$1.06. To put it another way, the Australian dollar price of nickel five years ago was around A$13.50 per pound. Today, it is A$9.40, a real decline of around 30 per cent for a miner with costs in Australian dollars, and perhaps a lot more after cost inflation is factored in. Well, thanks for that piece of news - it’s just what we didn’t need to hear. Sorry for bearing bad tidings, but that background explains why a number of nickel companies hit 12 month share price lows last week. Mincor (MCR) dropped to A98.5 cents on Friday, before closing the week at A99 cents for a loss of A10 cents. At this time last year Mincor was trading above A$2.00. Panoramic (PAN) lost A9 cents to close the week at a new low of A$1.83. Last October it traded as high as A$2.97. Before running through more prices, perhaps a big picture snapshot. Overall, both the base metals and the gold markets weakened by around 1.5 per cent. That was a better performance, moderately, than that delivered by the all ordinaries index on the ASX, which lost two per cent. And for our superstitious readers we have a few numbers which might send a chill through their spines. The all ordinaries index closed on Friday at 4666.6, which is the Devil’s triple 6, plus an extra 6 for good measure. And, if that doesn’t catch your eye the official exchange rate on Friday, as published by the country’s central bank, the Reserve Bank of Australia, was 1.0666. Let’s leave all that sort of stuff for someone else to worry about, and focus on share prices. Certainly, but you must admit it was an interesting coincidence. Still, moving on, and given that the trend was down across most sectors, it might lighten our readers’ days to hear first about companies which did not fall. There were a few interesting upward moves too that are worth talking about, thanks largely to discovery and production news. Top of the list was Navarre Minerals (NML), a company not mentioned here before. The company seems to have drilled through a few gold nuggets at its Bendigo North project in Victoria, sending the gold bugs in its home state into a frenzy. The official rise over the week was a gain of A20 cents to A31.5 cents, which translates to a rise of 173 per cent, though that tells only part of the story. On Friday alone, after a management requested trading suspension, Navarre rose by A17.5 cents, or 125 per cent on the day, with 17 million shares exchanged out of an issued capital of 25 million shares. Put another way, 68 per cent of the shares in issue were swapped in a trading flurry on a single day. Even so, and interesting as those market numbers are, it is worth pointing out that at its Friday closing price Navarre is still only capitalised at A$7.9 million, and while the top assay of 161.2 grams a tonne looks fabulous, the historic Bendigo goldfield is rich in nuggets, which will make it hard to ever prove a resource that satisfies modern banking or reporting requirements. That really is a rather silly state of affairs, isn’t it? Could not agree more. The gold is obviously there, but it’s in nuggets which do not fit comfortably into the code constructed by the Joint Ore Reserves Committee (JORC). There were some other eye-catching moves in gold too. Northern Star (NST), a company we will be hearing more about at our June 23rd forum, closed A10 cents higher at A50 cents, a 12 month high. Gold Road (GOR), which we took a closer look at last week, rose by A4 cents to A64 cents, but did get as high as A71 cents early in the week. And Kingsrose (KRM) recovered recently lost ground by adding A5 cents to A$1.43. Resolute (RSG) put on A6 cents to A$1.11. Best of the copper companies was Sandfire (SFR) which released a very positive feasibility study, adding A11 cents A$7.20. Metro Coal (MTE) was the strongest among the coal companies, putting in a rise of A12.5 cents to A63 cents. Alkane (ALK) led the way among the rare earth stocks with a gain of A21 cents to A$2.05. Time to call the card, starting with gold, and then roam across the other sectors, as you please. Notwithstanding the risers in gold that we’ve already mentioned, the trend was weaker. Among the handful of other companies that rose was Gryphon, up A4 cents to A$1.61, and Troy (TRY), up A1 cent higher to A$3.47. The fallers included Medusa (MML), down A17 cents to A$8.07, Integra (IGR), down A2.5 cents to A42.5 cents, Focus (FML), down A0.6 of a cent to A6.7 cents, Silver Lake (SLR), down A16 cents to A$1.71, and Kingsgate (KCN), down A27 cents to A$7.67. Beadell (BDR) was also weaker, down A4.5 cents to A78.5 cents, despite announcing a decision to mine its Tucano project in Brazil. After Sandfire, the best of the copper companies was OZ Minerals (OZLDA), which rose by A6 cents to A$13.61. Incidentally, the new code is a result of its recent one-for-10 share consolidation. Metminco (MNC) climbed a modest A1 cent to A36.5 cents, and Hot Chili (HCH) also managed a rise of A1 cent to A60 cents. Then came a long list of small fallers. Among them were Marengo (MGO), down half a cent to A29.5 cents, Horseshoe Metals (HOR), down half a cent to A24 cents, and Rex (RXM), down by A1 cent to A$2.66. Nickel companies were weaker across the board, as we’ve said. Only Mirabela (MBN) managed to rise, adding A4 cents to A$2.05. It was a mixed picture in the zinc space. Perilya (PEM) rose A5.5 cents to A64.5 cents. And Terramin (TZN) rose by A3.5 cents to A33.5 cents on news of a boardroom spill and speculation that former Normandy Mining boss, Rob de Crespigny, might be mixed up in the fracas. Iron and coal next, please. It was generally down in both of those areas. BC Iron (BCI) was the best of the iron ore companies, putting in a rise of A14 cents to A$3.00. Fortescue Metals (FMG) added A6 cents to A$6.46 after its founder, Andrew Forrest, shuffled the deck chairs and swapped the chief executive’s office for the chairman’s suite, in what most observers down this way see as a spot of window dressing ahead of a final legal decision on his future as a director. Among the fallers were Atlas (AGO), down A2 cents to A$3.58, Mt Gibson (MGX), down A7 cents to A$1.78, and Murchison (MMX), down A4 cents to A95 cents. In coal, Metro was the star, as we’ve said, but also on the rise were Carabella (CLR) and Aston (AZT). Carabella rose A6 cents to A$2.04 and Aston rose A10 cents A$10.00. Fallers included Macarthur (MCC), down A41 cents to A$11.25, Coal of Africa (CZA), down A1 cent to A$1.17, and Stanmore (SMR), down A13 cents to A$1.14. It takes a lot of finding, but there was one uranium company in the black. Extract (EXT) added A4 cents to A$7.76, even as it awaits the next instalment of its takeover travails. Berkeley (BKY) continued its slide, losing another A9.5 cents to A39 cents. Manhattan (MHC) dropped A15 cents lower to A42 cents, and Paladin (PDN) shed A18 cents to A$3.03. In potash, Potash West (PWN) caught the attention of a few punters after it put out a positive report on its west coast exploration program. Its shares hit a 12 month high of A31 cents, before closing the week at A25.5 cents, an overall gain of A6.5 cents. In minor metals, Metallica (MLM) released a positive report on its nickel, cobalt and scandium project, and also traded up to a A38 cents 12 month high, before closing at A37 cents for a rise on the week of A6.5 cents. Tin companies were weaker. Among the fallers was Venture (VMS), down A3.5 cents to A40.5 cents. Lithium companies also fell. Galaxy (GXY) slipped half a cent lower to A85.5 cents, and Orocobre (ORE) lost A1 cent to A2.15. Fear of nuclear energy can be guessed. Disasters in Japan on March 11, has been withholding from the momentum accelerated nuclear renaissance. Over the past few years, nuclear energy has been promoted by its supporters as an alternative energy source that is clean, efficient, reliable and safe for dirty fossil fuels, and the world agrees. A wave of new orders from BRIC countries as well as developed nations created a nuclear renaissance. Then over the past nine months, the price of uranium began to climb. Dormant since the 2008 recession, uranium rose from $42 per pound to a 52-week high of $72.65 in February. The spot price of uranium fell over 25 percent in the days following the earthquake and subsequent tsunami in Japan. Value investors helped the troubled commodity regain ground by buying the plunge. But the question is still on everyone’s minds: What’s going to happen from this point forward? On Monday, Germany announced it will shut down all of its nuclear reactors by 2022. The new policy is a complete reversal to the proposal to enhance Germany’s nuclear energy established by the government only seven months prior. The decision by the German government to end its dependence on nuclear energy has once again riled the uranium market, but I believe the German decision is just creating short-term noise. Once this noise is gone, uranium stocks will once again reflect earnings – and while sales to reactors in Japan and Germany may slump, the world’s other 436 reactors will be as hungry as ever for uranium fuel. Because as people are recovering from the Japan disaster – and possibly hating nuclear power more than ever – the supply and demand fundamentals of uranium have not changed in a significant way. The bottom line is that even in the wake of the Japanese catastrophe, uranium’s supply crunch lives on. If we look out over the next eight to 10 years, which is the amount of time it takes a nuclear power plant to become fully operational, the market is still about 400 million pounds short of projected demand. The top 10 producers, which make up almost 90 percent of the uranium market, only produced 110 million pounds of uranium in 2010. In other words, uranium producers need to produce nearly four times the amount just to meet estimated new demand. The new supply will have to come from somewhere, or the price of the existing supply will need to increase to clear the market. For uranium miners, the market is red hot. For investors, shares of the best uranium mining stocks could represent the best energy investment opportunity in decades. The World Nuclear Association’s chart below sums up why now is the time to get into uranium-related investments. The world will be using more uranium for years to come, and many great investment opportunities appear in the midst of a supply crunch. The supply crunch easily has the potential to become even more strained with 63 percent (note this is not the same as the top 10 producers mentioned above) of the current uranium production coming from only 10 mines worldwide. Additionally, the global supply of mined uranium is susceptible to supply shocks if one mine floods, or stops production for other reasons. The most direct way to profit from the coming growth in nuclear energy and the shortage in uranium is to buy shares in the most productive uranium miners in the world. As I stated over a month ago, the tragedy in Japan and subsequent fear in the market have presented us with the opportunity to invest in several well-managed and fundamentally sound uranium companies. For well-informed investors with the patience to tolerate volatility for a couple of months, I think this could potentially be the single best opportunity to buy and hold uranium stocks. Good economic growth in India was more than offset by slowing manufacturing data out of China and weak job numbers out of the United States. So far the mantra of “sell in May and go away” seems to be holding up this year. Once all the trading was done this past week, the TSX Ventures Exchange, home to more junior exploration companies than anywhere else in the world, had dropped 2.14 per cent, while the TSX Gold Index had followed suit, having also lost 2.14 per cent. Was there any good news around? Some. Shares of Sabina Gold & Silver managed to add a modest C$0.03 to close at C$6.89 after the company inked a deal to sell its Hackett River base metal project and a portion of its Wishbone greenstone belt in Nunavut to Xstrata Zinc Canada for C$50 million cash. Sabina also maintains reservation of a silver production royalty equal to 22.5 per cent of the first 190 million ounces of silver product and 12.5 per cent thereafter. For its part, Xstrata will spend at least C$50 million to complete a feasibility study on the project. And Augusta Resources had a good week after it announced that it had delivered its draft Environment Impact Statement for its Rosemont copper project in Arizona into the hands of the relevant authorities. These now have 30 days to provide final comments on the draft as part of the federal government’s National Environmental Policy Act. Augusta ended the week up C$0.14 at C4.44. But not all good news was favourably received. Fortuna Silver Mines failed to get a boost following news that it has achieved a better start-up production rate than it had previously hoped for at its the San Jose silver-gold mine in Mexico. The miner is producing at 1,000 tonnes per day and expects to hit a targeted 1,500 tonnes per day in the fourth quarter of 2013. Even so, Fortuna ended the week down C$0.40 at C$4.79. I think investors are more concerned about the future status of Fortuna’s Caylloma mine in Peru. The presidential election is on Sunday, and heading into the election the Peru government has suspended approval of all mining projects in parts of the southern state of Puno, which does not affect Fortuna but essentially halts Bear Creek Mining's Santa Ana silver mine project. Not surprisingly that news hit Bear Creek further, and its shares ended the week down C$0.78 at C$6.20. Any Yukon news this week? Not much. Capstone Mining rewarded shareholders by announcing that the Wildfire/Copper Keel area of its Minto mine in the Yukon will add 219 million pounds of copper to the overall resource at the Minto mine, using a 0.5% copper cut-off. But in spite of that Capstone ended the week unchanged at C$3.48. There was a bit more news from the Canadian-listed African miners. Shares of Semafo lost C$0.47 to close at C$8.08 after the he gold miner announced production of 60,000 ounces of gold in the first quarter at cash costs of US$654 per ounce. Of concern were the cash costs at its Amira Hill and Kiniero mines, which came in at US$950 per ounce and US$1,110 per ounce, respectively. Unrest in Burkina Faso, where Semafo has one of its mines, can’t have helped either. You’d think so, but another company working in Burkina fared well this week following good drilling news. Riverstone Resources tagged 38 metres of 5.6 grams gold per tonne on its Karma project in Burkina Faso. The junior closed at C$0.65 for a C$0.05 gain. Meanwhile, safely back in Canada, Grande Cache Coal announced profits of US$27.7 million or US$0.28 per share in the 12 month period ended March 31st, 2011. Coal sales for the year tallied 1.55 million tonnes, which was down on the 1.77 million tonnes tabled in the same period a year earlier. Grande Cache ended the week down C$0.28 at C$7.99. Elsewhere, in exploration news, Extorre Gold Mines hit 8.4 grams gold per tonne and 1,332 grams silver per tonne over eight metres at its new Zoe discovery on its Cerro Moro project in Argentina. The high flying company – which was spun out of Exeter Resources - also announced the discovery of silver-gold mineralization at its Puntudo project, near the Joaquin silver project owned by Coeur d'Alene Mines and Mirasol Resources, and 200 kilometres west of Cerro Moro. Highlights here included 42.3 metres of 0.6 gram gold per tonne and 16 grams silver per tonne. Extorre ended the week up C$0.11 at C$11.55. Also hitting some good intercepts was Torex Gold Resources. A step-out hole on the Morelos gold project in Mexico returned 2.7 grams gold per tonne over 44.28 metres. But the market failed to notice as Torex ended the week down C$0.07 at C$1.61. Staying in Mexico, Grayd Resource reported a 253 metres drill intercept running 0.88 grams gold per tonne from drilling in the Tarachi area of its La India property in Sonora State. Grayd ended the week up $0.08 at C$1.85. Poor job numbers out of the United States spooked investors on Friday and indications are that the markets will continue in skittish mood throughout the summer. We will see what next week has in store. Oil prices rose on Thursday when a trade is not stable because of the weakening dollar and the euro rallied on news the euro zone officials have agreed the principal of a new program for Greece's debt-laden. "It's another bail out boost. The dollar also got hammered by the Moody's warning about U.S. default and the Pembroke fire definitely provided some lift," said Phil Flynn, analyst at PFGBest Research in Chicago. Brent led the recovery after Brent and U.S. crude contracts felt pressure earlier as investors reacted to rising U.S. inventories and weighed OPEC sources' remarks indicating the group could hike output targets at a meeting next week in Vienna. Brent LCOc1 crude for July delivery rose $1.01 to settle at $115.54 a barrel, rallying after being pressured by the U.S. oil inventory data and pushing the Brent premium to U.S. crude CL-LCO1=R to over $15 a barrel. U.S. July crude CLc1 edged up 11 cents to settle at $100.40 a barrel. "Looks like Brent is following the euro rally on the Greece agreement in principle on dealing with their debt. There are still problems with Forties system also keeping North Sea firmer," said Tom Bentz, director of BNP Paribas Commodities Futures Inc in New York. A weaker dollar can lift dollar-denominated oil by attracting investors to commodities as a hedge against inflated currencies and by making oil less expensive to consumers using currencies other than the dollar. "Oil prices are too high. $100 oil is scaring people," one delegate said, adding a rise of 1 million bpd in OPEC's output target would result in only a small increase in actual oil supply from the group. "If this is 1 million bpd on top of the targets from over two years ago, then it's meaningless. If it's 1 million bpd above current production levels, then it's exactly what the market needs," said David Wech, analyst at JBC Energy in Vienna. U.S. crude stockpiles rose 2.88 million barrels to 373.8 million in the week to May 27, against expectations stocks would be lower. Gasoline inventories jumped 2.55 million barrels, more than expectations, while distillate stocks fell just under a million barrels, more than forecast. Silver's high fix, when it was way overbought, was $48.70 on April 28th. Gold held up briefly as silver toppled over, but as the commodities sector as a whole got caught up in the onslaught, gold in particular, was sold in order to raise cash against margin calls. Gold's high fix was $1,546.50 on the morning of 3rd May. The speed of the falls of these two metals is well-documented, but for the record, silver dropped to a low fix of $32.50 in 12th May, while gold fell to a low fix of $1,478.50 on 17th May. These were falls of 33% and just 4% respectively. On an intraday basis the price declines represented the unwinding of part of the most recent very sharp upward legs that had commenced in late January. Silver's move was unwound by 75% and while gold's correction was obviously much shallower, it was still over 40% of the post-January move. 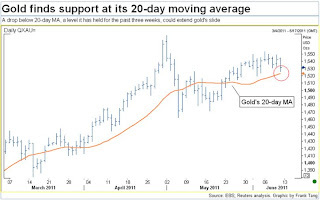 Gold's post-August 2009 uptrend has been by no means severed and in the immediate term gold would have to drop towards $1,450 before the support came under threat. Silver moved into more perilous territory, but here, too the overall medium term uptrend - discounting the March-April spike - is also intact. So what of the flows of funds in and out of the markets while these moves have been taking place? Silver is often cited as a much smaller market than gold, with this accounting in part for its higher price volatility. The approximate value of last year's mine production, for example (taking the annual average price) was $14.9 billion, while that of gold was $106 billion, seven times as large as silver. Trading patterns have been shifting and recent silver activity, on a pro rata basis compared with mine supply, has been much larger than that of gold. Gold turnover in the first-continuation on COMEX last year, at $5.5 trillion, was 4.1 times as much as silver's first-continuation turnover. Silver volumes have rocketed this year, however and gold turnover of 2.8 trillion in the year to late May was only 1.6 times as much as that of silver. Between the start of this year and the third week of May, silver turnover on Comex had reached $1.7 trillion, thus exceeding turnover of the whole year, while the daily average volume (based on turnover and daily close) at $17 billion, compared with $5 billion daily in 2010 - and this, it must be remembered, was merely the first-position contract. The gold:silver ratio since the start of this year has averaged 41.8:1 (compared with 62.1:1 in 2010), so this recent performance is pretty impressive; whether it can be sustained, however is open to some doubt as the metal's recent price performance is likely to deter some speculators and investors. Silver is renowned for this kind of capricious behaviour and this recent short sharp shock is likely to scare away more than just the faint-hearted, suggesting that the gold:silver ratio should continue to widen. COMEX speculators have already been voting with their feet. The CFTC figures for 24th May show that speculative silver longs were 9,386 tonnes and shorts were 3,949 tonnes, giving a net position of 5,437 tonnes. At its recent peak on 5th April, the net speculative long was 8,773 tonnes, comprised of 13,047 tonnes of longs and 4,273 tonnes of shorts. In other words, the combined speculative long+short position in early April was almost 17,200 tonnes and by late May it was down by 23%. The actual recent low was the previous week and there was a smidgeon of fresh long side interest in the following week so there is some tentative interest returning to the market, but we are unlikely to scale the April highs in the foreseeable future. Meanwhile in the major Exchange Traded instruments, the net inflow of funds into silver between late January and the price peak was $760 million. Some $1.4 billion left the funds during the correction, and a further outflow of more than $660 million has taken place since. Roughly $790 million when into the major gold funds while between late January and the peak in early May, while in the correction the funds lost $1.2 billion. Since then, however, although there were subsequent outflows the gold funds have stated turning round and have enjoyed fresh net investment of over $150M, giving us additional evidence that while gold is moving back into favour, silver market players may still tread with caution for the time being. When Gold has moved more like a commodity different from the currency in recent weeks, the correlation indicates that the relationship with the currency, the dollar in particular: The euro is tightening. While gold is clearly a monetary asset and will, if anything, extend its influence as the only non-fiat currency (especially following developments in Europe last week), it is clear that in recent weeks it has been moving more closely in line with the rest of the commodities sector than with currencies or other financial instruments. Correlation analysis however shows that the relationship with the $:€ rate is tightening, while that with the G6-trade-weighted rate appears to be relatively static. The price in euros, meanwhile, has been tightening its relationship with credit default instruments as concerns over European debt have intensified once more. Obviously risk appetite is an important driver of short term movements in the financial sector and this has been a key to the comparative homogeneity of the commodities sector, stretching back at least as far as the collapse of Lehman Brothers. The correlation table shown here does demonstrate, however, that "perception of risk" per se, as measured in this case by the VIX volatility index, is taking something of a back seat to currency movements, while gold and the equities are forging ever closer links - and there has been a sharp strengthening in the relationship with the ten-year bond. All of this tends to confirm the perception that investors remain nervous and this argues for further highs in due course. The path will not be a straight one, however, as there are still possibilities of the occasional bout of liquidation as a result of distress and in order to raise funds. Any dollar strength is likely also to see gold falter. 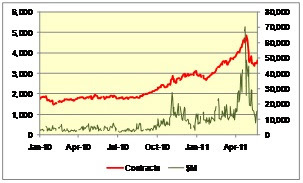 The $:€ rate has been one of the more important drivers of the dollar gold price during May at almost 37%, higher than the 34% correlation that has prevailed since the 7th of March when Greek debt was downgraded, and rather stronger than the 21% correlation since the day that Lehman Brothers filed for bankruptcy. The euro price itself, however, has scaled new heights in response to the further downgrading of Greek debt in the last week of May, not to mention prior downgrades elsewhere in Europe, and persistent disagreements within the Federal Open Market Committee about the outlook for the US economy and how to manage policy after the end of QE2. Sentiment would also have been boosted by more political debate following the progress in the European Parliament towards allowing clearing houses to use gold as collateral. The proposal has cleared one hurdle, with the Committee on Economic and Monetary Affairs voting to allow central counterparties to accept gold as collateral under the European Market Infrastructure Regulation. This now needs to go to vote in the European Parliament and the Council of the European Union in July. While unlikely to have any specific impact on the overall supply-demand dynamic, the approval of the use of gold as collateral would further cement the metal's role as a non-fiat currency. The close correlation with other commodity prices demonstrates mass movement of funds rather than the increased influence of any one individual element. Although the fall in silver was largely regarded as responsible for the rout in the commodities sector in the first half of May, the gold-silver relationship has always been a tight one. Gold drives longer-term trends on the back of financial and economic considerations, while shorter term moves in silver will often presage changes in trends among the two because of its higher volatility that often causes it to be used as a geared method of playing the gold price. For the time being the commodities are moving together although platinum and palladium are taking a slightly different course on the back of positive investor sentiment with respect to their fundamental outlook. For the time being, though, underlying shifts suggest that when it comes to gold it should also pay to watch the currencies, closely. It is arguable that gold had become overbought in euro terms and that a further correction is now likely. Finally, one of the keys to the $:€ rate is of course the state of sentiment over European debt woes and that, by definition, impinges on the gold price. The correlation between the euro-denominated gold price and the Greek CDS ten-year credit default swap has been an impressive 24% since the date of the March downgrade of Greek debt, compared with just 2% since the date of the Lehman Brothers' collapse Gold's influences are always many and varied; Europe is currently an important key.